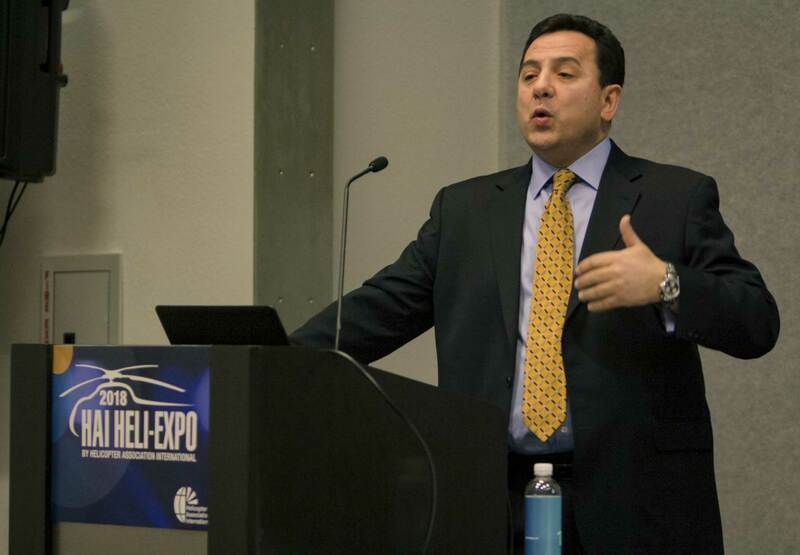 Rolls-Royce’s Mike Mekhiche sees greater airborne use of electric systems. Rolls-Royce sees a potentially electric aviation world on the horizon coming in stages, both incrementally and disruptively, according to Rolls-Royce Electrical global head Mike Mekhiche. Some changes are already flying, such as commercial aircraft with more electric systems, such as the Boeing 787, while more disruptive forces and parties have yet to appear in the market. The coming vertical takeoff and landing (VTOL) wave of all-electric or electric-hybrid aircraft hold the promise of unlocking new regional and local commuter markets, but could erode demand for some rail and airline service and weaken the small business jet market. A spectrum of new vehicles are expected to have capacities of four-to-100 passengers. VTOLs could start adversely impacting the helicopter market by 2025, said Mekhiche. The shift to full or partial electric offers the benefits of reduced operating costs, emissions, and noise, while allowing for more flexibility in vehicle propulsion integration and energy sourcing. Mekhiche explained four potential models of power distribution; the more electric engine, full system electrification, partial system hybridization, and full system hybridization. In a more electric engine there are more electric accessories and secondary aircraft systems that combine to reduce fuel burn and emissions, increase engine efficiency, and improve engine efficiency and life. With full system electrification, as in a turbo-electric system, there is no energy storage; however, there is distributed propulsion and power systems. In a partial hybridization system, the engine can be downsized and electrically boosted, recover and store energy, and blend conventional and electric thrust. This can result in a lower noise profile. A full hybrid system can be operated with the engine off in full electric mode and has even larger energy storage potential. A common architecture that could be used across multiple aircraft using technology that is available today follows the turboelectric hybrid model and features a single turbine engine/generator, power controllers, battery pack, electric motors, and propulsors.